Hey, I’ve found that mysterious statuette artist! Remember my post about the incredible statuettes in Morro Bay, CA where I wintered? With one stone so delicately and dramatically balanced atop another? Some of them four stones high! No cement, no glue, nothing but gravity to keep them standing up. Amazing! I wondered who the unknown creator was and asked around. Nobody knew. Well, I found him! He is 42-year-old John Petitt … a man with a hard, sad past as a druggy who has finally, finally found himself. John Petitt is making up for lost time by quietly creating stunning things like this. This one rests on a tree stump! Well, the ones I sent you pictures of – as fantastic as they were – are puny compared to the new statuettes I’ve found. So much more challenging, interesting, impressive. I found these new ones while riding around on my trike. At St. Timothy’s Church, I came to a corner with a dozen of these beauties. I was amazed. Some were bigger. Their construction was more challenging. Some made of three stones, some four. Even one of five! Again I wondered, who is creating these things? Who has the talent, the skill, the patience? Who? It’s hard enough to get three or four plain building bricks to stand up on edge. 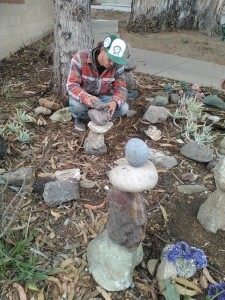 To do it with stones of different sizes and shapes seems totally impossible. Is it the same person? Somebody else? What’s their point? The next day I returned for another look. A couple had toppled, sorry to say. The others were fine. The mystery deepened. Again I pedaled around St. Tim’s grounds. Flowers, interesting plants, all beautifully arranged. It’s more than a yard. It’s a lovely garden. Often I pedal through just to enjoy its beauty. And it’s so quiet and peaceful. I spotted Taylor Newton. He’s there often. He was hard at work. He had half a dozen young guys and gals helping him. Taylor is the one who transformed the church’s grounds so beautifully. I’ve written about Taylor before. He is unusual, extraordinarily unusual, unlike any gardener you’ve ever met, I’m sure. Because of why he gardens. He‘s in his late 30’ss, fit and muscular and tanned, as you’d expect. He’s more than an expert gardener. Taylor is a degreed, bona fide scientist who did science and then found a totally different calling. In social work, would you believe? In working with people. He loves growing things, but helping people is what drives in, I believe. 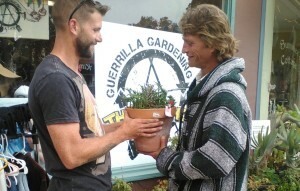 He is the founder and guru of Guerrilla Gardeners. Such a crazy name. Who would ever come up with a name like that? It’s a “club” of ever-changing members, most of them young adults. Troubled, many of them. Dropouts. Stressed one way or another. Often homeless. On the lam, running away, not sure where to go next. Most likely without much schooling, without skills, without a social support system, without hope. Taylor takes them in, sees to it they have food to eat and a place to sleep, are safe, and puts them to work. Work meaning gardening. The gardening becoming therapeutic and even life changing. St. Tim’s grounds are so beautiful for the simple reason that he makes it his base and puts in hours and hours there. But he also takes his guerillas to other places in Morro Bay and nearby, to do the same thing–make them beautiful with flowers and plants, bushes and trees and hedges. I was puzzled when I heard he called his gang the Guerilla Gardeners. Taylor Newton and John looking over a succulent. John has become one of his Guerilla Gardeners. Is learning fast. Why? It was one of the first questions I asked him. Well, he liked the word. He’s not given much to standing around and talking. I speculate he thinks of his followers as the guerillas we hear fighting in wars here and there. You know…Vietnam comes to mind. Or Guatemala. All volunteers. No uniforms. Loosely organized. Committed to a cause. Using whatever guns and knives they can scrounge. Popping up here and there to fight. Using surprise as a principal strategy. John’s pupil Victor, also a “guerilla,” has talent aplenty, too. He declined to disclose anything else about himself. So be it. hoses and other gardening stuff. Not fighters. Peaceful people. But they’re guerillas in the other ways. It is a surprise to see him working on a new spot! Well, that’s my take. And he put me in touch with him. I call them statuettes for lack of a better word. John doesn’t call them that. In fact he doesn’t have a name for them. Why do I like them? Why am I so fascinated that I want to tell you about them? Their final shape is so interesting. Their balance so delicate. The whole idea seems so crazy–making something strikingly beautiful out of nothing, just the stones lying around. I don’t know how much he knows about physics, particularly the law of gravity, but gosh, he’s got a touch that defies that law. And for sure any little corner of land that he tackles is turned into a unique little outdoor art gallery by his efforts. You can stand back and study and enjoy his statuettes without having to pay a penny. That said, I’ve noticed some folks have no interest at all. Don’t pause a second. Hard to figure. Sad, I think. Well, I’ve had two deep talks with John. I was surprised how he opened up and leveled with me. The guy has had more than his share of troubles. He told me it’s okay to share some of this stuff with you, which surprised me. He said he grew up poor, on his dad’s farm in South Dakota, putting in long days of hard work. He got to do all kinds of jobs. At age 13 he was driving the truck, delivering bales of hay. A cop spotted him, saw he was just a kid, pulled him over, and little John found himself in deep, deep you know what. What to do with him? He was shipped off to a Job Corps unit. That seemed the right thing to do with him. Just before he got out of Job Corps, six kids in his class ganged up on him. Pummeled him. Knocked him to the ground senseless. He broke his skull. He spent six weeks in the hospital. He put in several years at Job Corps and got out in his late teens. It was a good thing. He could read and write and had solid training in brick masonry, auto mechanics, auto body repair, and welding plus the all-important GED. No way did he want to go back to the farm. He hit the road. He got by by using his new skills. Little jobs. Longer jobs. He moved often. Months went by. Years. He met a nice gal and got married. “But she wasn’t the lady I thought she was.” They split. He kept moving. One day he tried Meth and liked it. Used a lot of it. Became hooked. “Nobody talked me into it. Or gave me a sample. I wanted it. I have nobody else to blame. It was my fault. He kept traveling. Was down to using a bike. He wound up in California, in Bakersfield. After a while he decided to move on again and got on his bike and in some time wound up in Morro Bay. He liked it a lot. And ran into Taylor Newton and became one of his guerillas. He was thinking he would never be able to live without meth. He decided to quit cold! Impossible, it is said. But he did. He says he’s clean now, and for good. Oh, he’d go to the beach and watch people surfing. Decided to take it up. He thought a good start would be by getting good on a skateboard. One day a bad spill. “I split the tibia in my right leg straight down!” In the hospital for 10 weeks. He made a great recovery. He’s very limber now. In one town one day he was sitting on the ground, taking a break, and spotted some stones. Roughly the size of an egg. Just playing, he managed to balance one on top of another. In Morro Bay he started doing it seriously. He built dozens of statuettes, here and there and there. A few fellow guerrillas have followed suit. I asked him for a demonstration and he said sure. We met at that corner behind St. Tim’s. He’s the one who had created all the statuettes here. Working with him was a young fellow, Victor.. Each was building a statuette. I watched them both. John was the master, Victor the apprentice. He had talent. John was the one I focused on. He’d pick up a stone, choose a good spot on the ground, and set it down firm. Choose another stone. It might be smaller, even bigger, symmetrical more or less, or crazy shaped. No matter. He’d hold it atop the first stone and study a minute. He had a good idea where to start. He’d shift the stone this way a hair, that way a hair, not letting go. Just testing. Then he let go. Oops, the stone fell. He started again, ever so delicately. It stood up! He chose another stone, then another. He was fast. He’d build a statuette in just three or four minutes. A tough one just a bit longer. There was a stiff wind. A couple of times one collapsed. No problem. No big fuss. He’d just rebuild it. As I said in my original post, no glue, no cement. 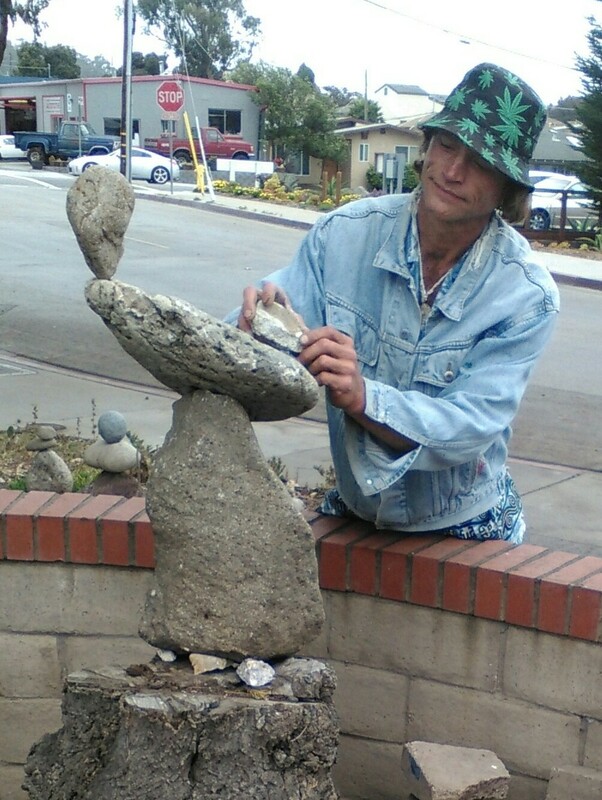 He had a sixth sense about exactly where to position the new stone in his hand. A special talent. He was surprised that I would seek him out. Surprised that I thought he had an extraordinary skill. He smiled when I called him an artist-–but he is an artist. It seems that praise had been a rare thing in his life. He became outspoken. Here’s one instance. Some people say substance abuse is a disease, your body become so dependent on that kick that you need it, need it, need it. He told me his dad had died long ago but his mom was okay. Had he kept in touch? He said he tried. He’s get good news. In rehab after he broke his leg, he met a lady, an old lady, Donna, being treated along with him. They took a liking to one another. She went home to her place. She lives alone and has difficulties. He has moved in, does chores, whatever has to be done. Seems a good deal for both of them. John and I talked on the phone. He brought her up every time in an affectionate, caring way. My feeling is that he nurses her, and she nurtures him. When we parted, we shook hands. Ouch! It was instant proof that he has done tons of hard, hard work. So, why does John get a kick out of creating these statuettes? I don’t think it’s to create art. If one falls, so what? He’ll just put it up again. I think it’s simply the challenge of accomplishing something that seems impossible. In a way, like getting off meth cold. P.S. I goofed. This was written seven weeks or so ago but got “lost” in my Draft folder. Embarrassing. My apologies to John Petitt and Taylor Newton!